How do I choose the type of healing that is best for me? It is recommended that you allow Shaman Elizabeth to ask the spirit guides to choose the most appropriate healing for you. You can indicate your concerns, such as health problems, inability to maintain close relationships, anger, depression, inability to move forward, etc., but these are symptoms of a deeper root cause. The main issue is often below our consciousness and will be brought to the surface with the Spirit’s guidance. What is the difference between a shaman and shamanic practitioner? The title “Shaman” is usually bestowed on an indigenous man or woman by his or her community after years of practice and dedication. Non-indigenous people usually refer to themselves as shamanic practitioners or neo-shamans to differentiate their cultural background and/or out of respect for indigenous tribal customs. Shaman Elizabeth uses the title “Shaman” because her spirit guide bestowed it upon her. 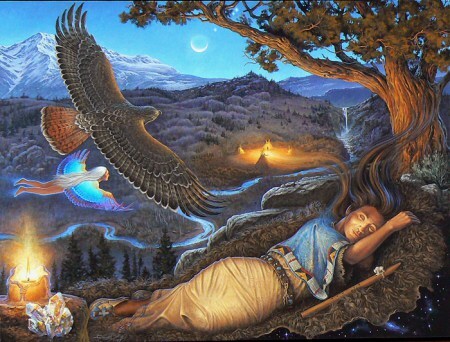 This happened when her friend was visited in a vivid dream by Shaman Elizabeth’s spirit guide. He invited her friend to participate in the celebration of Shaman Elizabeth becoming a shaman. In the dream, the spirit guide and other spirits invited the friend to dance around a fire with them. Afterward, the friend saw them put a beautiful purple headdress on Shaman Elizabeth and proclaim that she was now a Shaman. A dream of itself would not have been enough. What made this dream extremely powerful and believable were several things. One, the friend, who was an atheist at the time and did not practice shamanism or metaphysical activities, strongly believed she had been visited by these spirits, stating it was extremely realistic. Two, this friend just happened to be the first person Shaman Elizabeth had performed a healing on many years earlier. Lastly, this friend had no way of knowing that Shaman Elizabeth had made her first visit to a metaphysical healing center earlier that same day to offer shamanic healing services for the first time. The timing and messenger were perfect. For Shaman Elizabeth, the transition was black and white. One day she was a shamanic practitioner – the next day a Shaman. There are many who will disagree with her using the title Shaman, however, she knows that her spirit guide has the ultimate authority to bestow this title and defers to his judgment. After all, she trusts his judgment for healings. Keep in mind that everyone has the potential to be a healer. There’s no special power bestow on anyone that isn’t available to all. Is shamanism against my religion? Shamanic healing comes from a divine, loving power and does not conflict with anyone’s religion, practice, belief or even lack of belief. Why don’t healings always work? Below are the most common reasons a healing doesn’t appear to work. If a person has two wishes that conflict, then obviously that person will experience disappointment of one of them. For example, a person may want to be healed of a disability, but doesn’t want to go back to work. Why would a miracle cause fear? When a person experiences a transformation in this reality that cannot not be explained with laws of this world, they have to accept that there is a greater force outside of this reality. This could result in uprooting their entire belief foundation and cause fear. Miracles prove that the spirit is more powerful than the body — for some this can induce an unwarranted (although common) fear of dying. The Spirit will withhold a healing if it will induce fear, however when the person is ready to accept the healing without fear, it will unfold. If you have crabgrass in your yard, you know that just yanking out the top shoots will only provide temporary relief. As long as the roots remains, the crabgrass will return. It’s the same with healing. You can’t just treat the symptoms, you have to get to the root of the problem. Sometimes during a healing, the root cause will be revealed, such as a childhood trauma or a past life event. Everyone creates a spiritual plan before entering his or her lifetime. Sometimes the original plan takes precedence over a client’s current wishes. For example, a mother requested a shamanic healing for her teenage daughter, who was severely mentally impaired, needed constant care and was prone to violent outbursts as the result of a difficult birth. During the healing, I was told by the spirit guide that the young girl had agreed to this disability before coming into this life to learn an important, yet tough, lesson. In previous lives, she had been an extremely beautiful woman who enjoyed many privileges, but she had been unkind and sometimes cruel. In this lifetime, she was again born beautiful, but this time was unable to take advantage of her beauty and relied on others for her basic needs. Her mother’s current wish for the healing conflicted with her daughter’s initial desire to make spiritual progress by tackling a difficult life lesson — only one could be honored. Once a healing is given, it needs to be accepted, even if on an unconscious level. If a healing is not accepted, it does not disappear. The healing request will remain in effect, waiting patiently until the person is ready to accept it. There may be additional life experiences that the person needs to accomplish before they are ready to accept the healing. Sometimes additional healing sessions need to be performed to remove the blockages that stand in the way of accepting the healing.